Where Is My Flagged Topic Now? I've heard hosts play favorites, are there any fair contests? How do I put a link to my song in the contest topic? What do people mean by "flagging", "un" or "unflag"? A great way to expand upon your group of friends is to join in a contest or challenge. Follow this simple tutorial to learn how! Click on the 'Message Board' tab in the main menu bar. Then click on the 'Public Categories' subtab (by default you will be here when you click the Message Board tab). You will be presented with various message board categories. First you need to determine whether you want to compete in a contest, or just participate in a challenge. Generally speaking, contests involve eliminations and awarding a winner, while challenges are non-elimination and are based on community involvement and interaction. 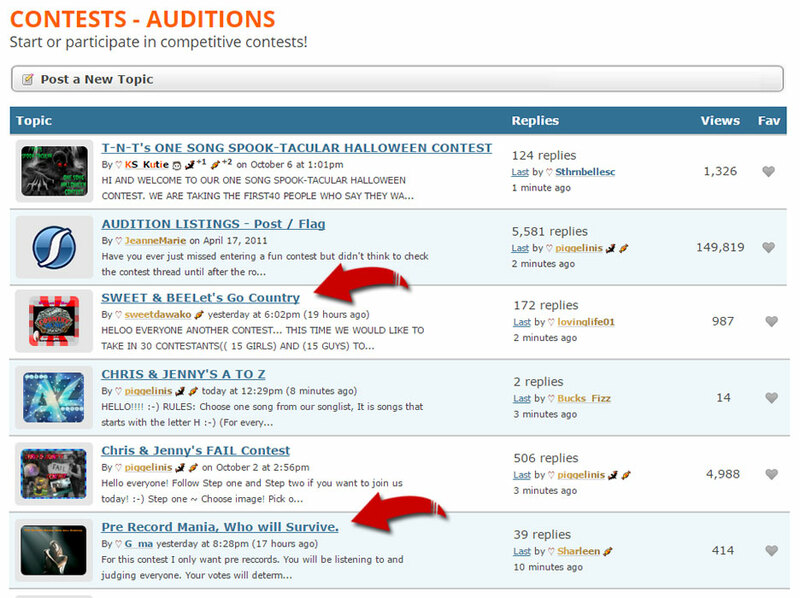 Carefully scan the list and find either Contests - Auditions, or Challenges - In Progress. Click on whichever category interests you. There will be various topics in each category either for contests which are open for auditions, or current on-going challenges. Browse the topics and find one that sounds interesting to you and click on it. You can also click on the grey heart next to the topic to add it to your favorites for easy access. Once you click on the topic, carefully read over the instructions. Determine what the rules and guidelines are and sing your song. Once you're ready to submit your entry, go to the last page of the topic to reply. In large text field, type in your song information in the required format. When you're done press the "Post Reply" button and you're done! Click on the 'Message Board' tab. Click on the 'Favorite Topics' sub tab. Have Fun and Happy Singing! 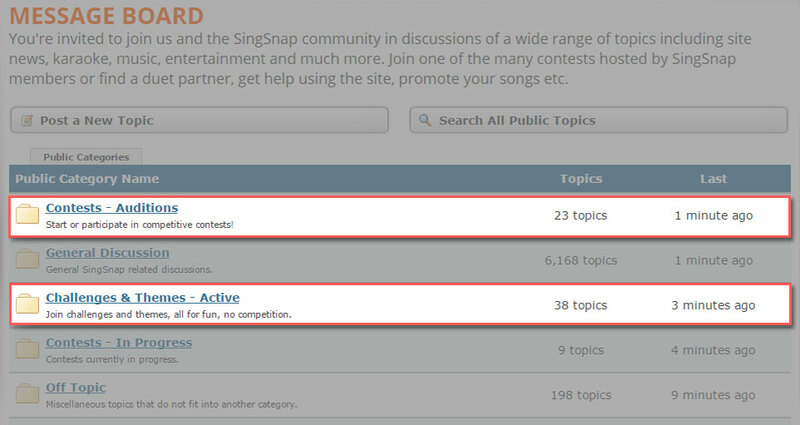 The vast majority of contests held on SingSnap are hosted and judged by conscientious and fair minded people. Try to keep in mind that everyone hears and responds to a piece of music in a different way. Some are affected by the technical delivery, some by the emotional. What may be an angelic choir to you, may sound like the shrieking of tormented souls to another. Our best advice is to approach contests with the intent to have fun, possibly learn something new, and to compete in a gracious manner, win or lose. If you truly suspect a fellow contestant of actually cheating, the best thing to do is to alert the host via private messaging as to your concerns. Be polite, and let them know why you feel the way you do. It is then up to the host to decide what to do. A good host will take your account into consideration, but will do as thorough an investigation as possible to try to come to the most likely answer, and will take the appropriate action. If you suspect a judge or host of bending the rules to accommodate a favored contestant, or of blatantly judging an undeserving, but favored contestant higher than others, your best course of action is to send a private message to the contest host and politely express your concerns. It is possible that you may not have the whole picture, and hopefully they will be able to set your mind at ease. If communication breaks down, it is best to remove yourself from the contest, and contact SingSnapSupport to express your concerns. It is never all right to make public accusations, or to incite dissension within the contest by posting negative comments in the contest topic or by sending other contestants private messages with your accusations. This could get your message board privileges suspended resulting in missing out on other contests. Placing a recoding link in a topic reply is very easy. First you'll need to copy the recording link for the song you want to share. This is located to the right of the song player on each recording page. It's listed in the "Link" box. To copy the link left click on the link box and then right click and choose copy. Now you're ready to post the link. Go to the topic you want to reply to and find the reply box (bottom of the last page), right mouse click and paste the link into the reply box. You can add text before or after the link, but make sure there are spaces between the link and any text you add. Flagging is a way to mark or save your favorites on the site. You can flag songs, artists, members, recordings, private messages and message board topics. The terms "un" and "unflagging" are typically used in contest topics. These terms indicate that someone is unflagging the particular topic. This is normally seen at the end of a round or when the contest has ended. For each item that can be flagged you'll see a small gray heart for the item. By clicking this heart you are marking or saving the item as a favorite. When an item is flagged as a favorite the heart will turn red. To unflag an item simply click the heart again. This will return the heart to gray signifying that you've unflagged the item. On the main tabs (Watch & Listen, Record, Sing, Message Board), as well as your Profile page, you'll find that each area has a Favorites sub menu option. These pages are where you can review many of your flagged items. The only item that differs is private messages. They have their own special area on the site. To review your flagged private messages click on the Messages button in the Navigation bar and click on Flagged in the sub menu.